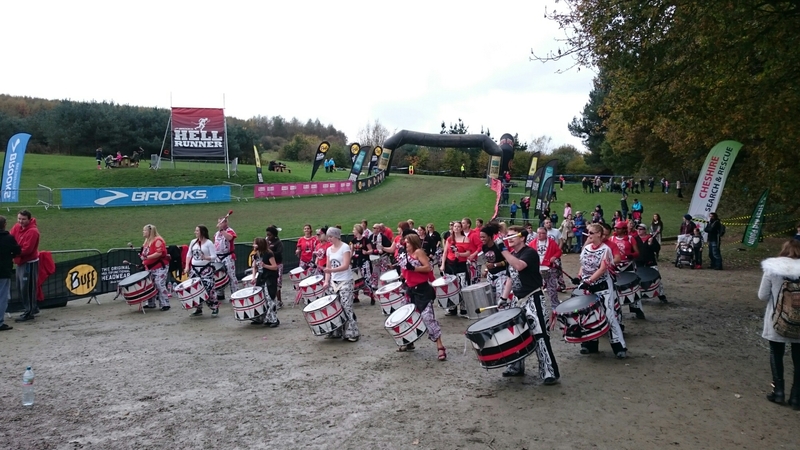 This morning was Hell Up North, part of the Hell Runner series, in Delamere Forest, Cheshire. About 12 miles of trail running through challenging terrain. The weather has been uncharacteristically warm for this time of year (yesterday was the warmest Halloween on record), so I was a bit too warm for a lot of the run and consequently sweated out much more than I had hoped. Stumbling, wading and paddling through bogs was the hardet part- adjusting to the freezing water after being too warm. The course also featured both heaven and hell (I won’t say too much so as to not spoil it for future runners), plus plenty of short, sharp steep banks to run up… We’re talking 45 degree inclines here. Killer! There was the usual jostling for space at the beginning, but I found mysrlf running with the same few faces for the second hour. Near the end I was running at a similar speed to the second lady, so I picked my pace up to keep up and share some of the crowds cheers that were aimed mainly at her! All in all, a great morning out and a great finishing position for me, followed by being hosed down by the local fire brigade!